You all should have believed Anna's email today; it was a nice ski day. Being a 100% sample of today's skiers, here's what I found: thin but adequate coverage all over. John and the crew have done an amazing job on the trails, and there were almost no rocks, but a number of sticks here and there let your skis know they were there. (Do help by pulling out any you see--always.) The surface is fast, but you sure don't want to go fast, because of the above. It is very, very beautiful, and this cold weather should keep it so. John rolled the trails to compact the snow, and even a little bit more should make the skiing great. But give it a try tomorrow if you can. I went on Wild Rice, Boardpile, Laurel, and Pitch Pine. Oh yes, it was very cold, and I misjudged my clothing. Anna, thanks for the stove in the shop afterwards. Pictures on next page. Tele Clinic for Jan. 20th is canceled. It's a sad day in January when we have to cancel a ski clinic, but lets think positive about a future date in February. This clinic is a great opportunity to learn to ski more difficult terrain. The tele turn will help you get there! Don't miss this clinic, taught by expert Kevin O'shea. The Crystal Lake Skiers Association and Crystal Lake are putting on a telemark clinic for beginners on Sunday, Jan 20, from 10-12 am and 1-4 pm. It is snowing as I write, and the prediction is for snow on-and-off all week, so there's a decent chance for enough by the weekend. Keep watching the weather and this space. If we can't hold it on Jan 20 we will announce another date. Kevin O'Shea, the master telemark skier of Country Ski in Montoursville, will be the lead instructor, with help from John Manifold, Ez Burgess, and the rest of the local telemark crowd. We have a pile of demo, duplicate, and used equipment to lend: all you need is a metal-edged ski, preferably with a soft camber, and either a NNN-BC binding and boot, or a heavy-duty three-pin, or a cable. We'll be at the old downhill area. Uphill is human power, but don't scoff--proper wax is all you need! 1. Learn to switch from the stance used for kick-and-glide to the stance used to telemark, in which the upper body is centered over the ski with both hands forward. 2. 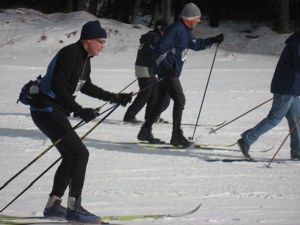 Practice entering the telemark position: a lunge motion with one foot moving forwards as the other retreats. Weight should be equal on both feet, and (if turning) on the big toe of the forward foot and the little toe of the rear foot. 4. Turning: to learn the turn start with easy kick-and-gliding then complete the telemark turn from the diagonal stride; use up-and-down body movements to release the skis; begin to link turns. HAVE CONFIDENCE. ALL WILL BE EXPLAINED.